'Boring' Singapore City Photo: What do you do on a bus? 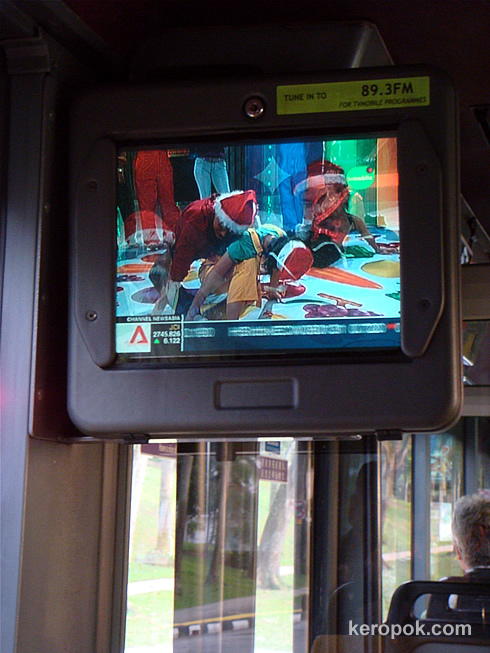 In Singapore, about 1500 of the buses have television sets installed. This is an example of one taken yesterday. It is called TV Mobile. i know that NingBo in China, the buses there have something like TVMobile. But if I were to compare the 2 services, I think TVMobile has to look into Ning Bo's. Nothing like that here. We just look out of the windows at the scenery - or I suppose one could read a book.